Groundbreaking has begun on the new Hall of Science with a generous $5 million gift from Board of Trustees member Gary Abramson, SPA/BA ’68, and his wife, Pennie Abramson. The airy and modern facility will embody the university’s commitment to support the sciences—the fastest growing area of undergraduate study at AU. Conceived to maximize collaborative research and foster discovery, the center will serve as a catalyst for success for students and faculty and enhance the university’s impact in every field. AU is poised for a new level of scientific achievement. The College of Arts and Sciences has seen a 116-percent increase in research grants over the past five years, securing 48 unique awards from the National Institutes of Health (NIH) and National Science Foundation. In 2018, its faculty received a total $8.3 million in new research funding. The upgraded facilities will position the university to receive more funding grants as opportunities arise for researchers utilizing the facility’s advanced labs and infrastructure. “This state-of-the-art facility brings together students and faculty across disciplines to support the highest caliber of research and teaching, and foster innovation inside and outside the classroom,” says Victoria Connaughton, professor of biology. The three-story building, with its expansive 95,000-foot gross floor area, will transform how the sciences are taught and learned and how research is conducted at AU. The departments of biology, environmental science, chemistry, and neuroscience will be housed here to encourage interdisciplinary interaction and spur partnerships. 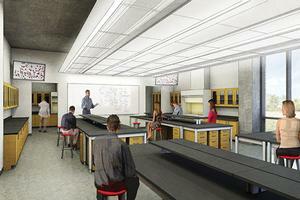 Functional lab groupings will cluster scholars for optimal efficiency and academic interchange. Designed with an eye on the future, the facility will have the capacity to adapt to advances in and changing requirements of scientific research. The building, on track to be LEED Gold-certified, will stand as another mark of sustainability on AU’s carbon neutral campus. The university’s investment in the sciences will enhance the student experience, encourage innovative problem solving, launch new academic programs, and promote the shared exploration of the most challenging concerns of our time. An initiative to raise $40 million for the Hall of Science is underway.